Dolce & Gabbana truly are fashion royalty, and the duo have truly pulled out all the stops in the latest AW14 Dolce & Gabbana underwear collection, which is now available at UnderU.com. The polka dot was a notable feature in the Dolce & Gabbana catwalk shows for Autumn Winter ’14, and their latest men’s underwear collection sees the polka dot featured strongly too in a series of polka dot design waistbands. The rich burgundy boxer trunk is my personal favourite, whilst the black with white contrast trunk is one I might go for too. 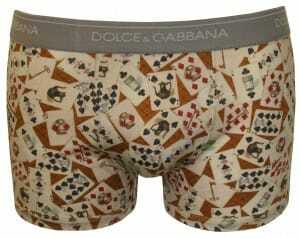 Perhaps in slight reference to their positioning in the fashion world, a series of royal prints appeared in the main Dolce & Gabbana Apparel collection, and this theme of royalty features beautifully in the AW14 underwear collection, with my personal favourite being the Royal Card Print boxer trunk. The print is fantastic whilst the contrasting branded waistband just really sets it off for me. Truly fit for a King… can I wear them I wonder? Other highlights in the Dolce & Gabbana underwear collection for Autumn Winter 2014 are the Sporty Stripes modal / stretch cotton trunk and brief, as well as the split branding waistband feature in the Visual Game brando briefs in black and white. The matt stretch cotton trunks and briefs in black and white are at the lower price tag end, but still retain prominent Dolce & Gabbana branding and their renowned quality fabrication.